Farewell to the Wittiest of Wine Writers. 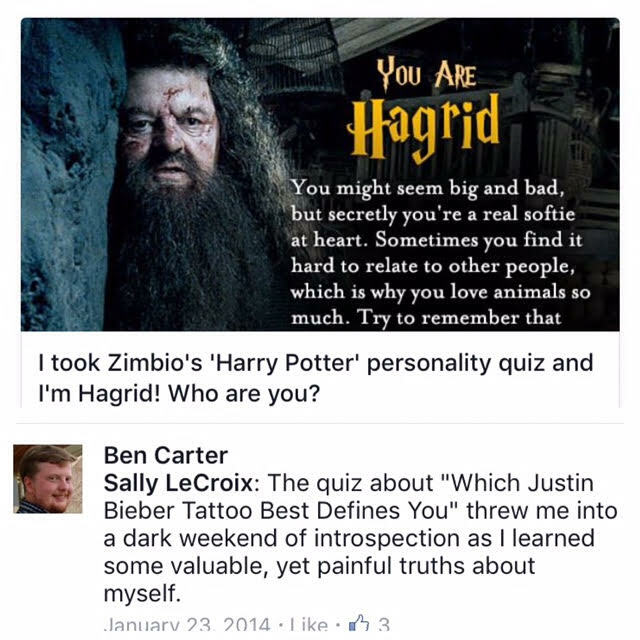 I Will Miss You, Ben Carter. I met Ben, also known as Benito of Benito’s Wine Reviews, in New York City while on a media trip hosted by Snooth, shortly after I responded to a Tweet from Ben asking if anyone from our group of wine writers wanted to share a cab with him to the first of many wine tasting events that would take place over the next couple days. Not knowing anyone from our select group of writers, I quickly accepted his invitation and met him in the lobby of our Chelsea-Manhattan hotel. We became instant friends, beginning as early as that first evening in New York City, where I was able to get a glimpse of Ben’s witty remarks during many casual group conversations – I admired his lighthearted laughter that was notably contagious. I also marveled at his enthusiasm for wine and food, and I particularly enjoyed witnessing his undeniable zeal for Oregon wine. 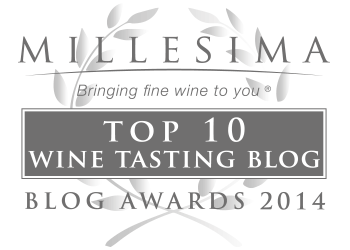 Our friendship grew over the next several years: we would cross reference similar articles and share links to each other’s pieces, and we would exchange tasting notes and commentary while on-line during frequent virtual tastings. 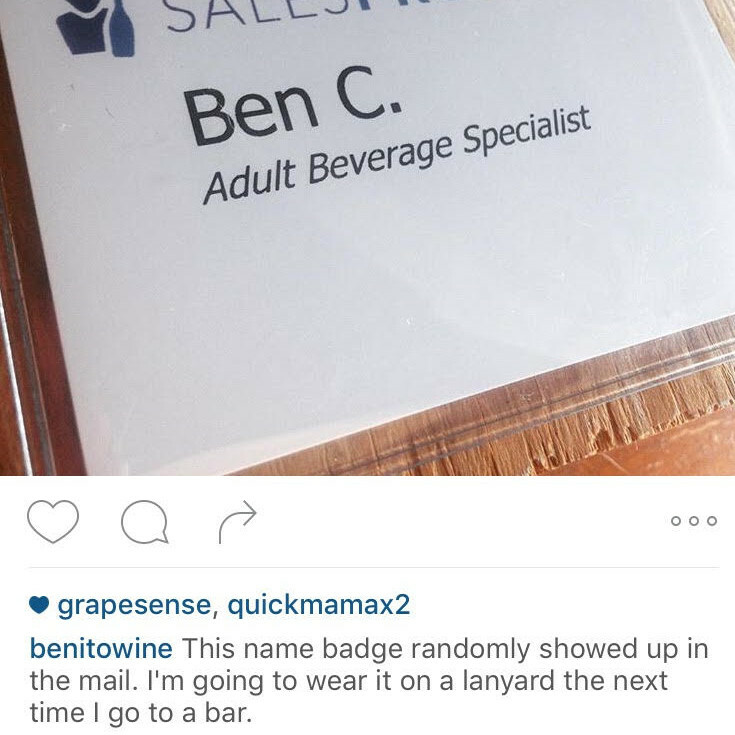 Virtual tastings are organized tasting events that take place on Twitter, Ustream, Google + and various other social media outlets; Ben always made a friendly entrance when joining events, being sure to say hello to everyone he knew. It was during a virtual tasting that I realized Ben was a superb listener – his questions for the hosts were always well thought-out and truly relevant, which showcased his respect for (and attention given to) the vintners and wineries being featured. I had a watchful eye for his posts and comments, knowing that at some point I’d end up laughing myself to tears. Attentive and respectful as he was during the tastings, Ben always had something hilariously witty to say at the most perfectly appropriate moments. I was thrilled to be featured on Bens well-read site, giving me exposure like I had never had previously. When the opportunity came up to pitch a piece to the Memphis-based southern lifestyle magazine, CLICK, I proposed that I interview Memphis-native and award-winning wine writer, Ben Carter. It was the best way I knew to thank Ben for the wonderful interview he had featured of me on his website. 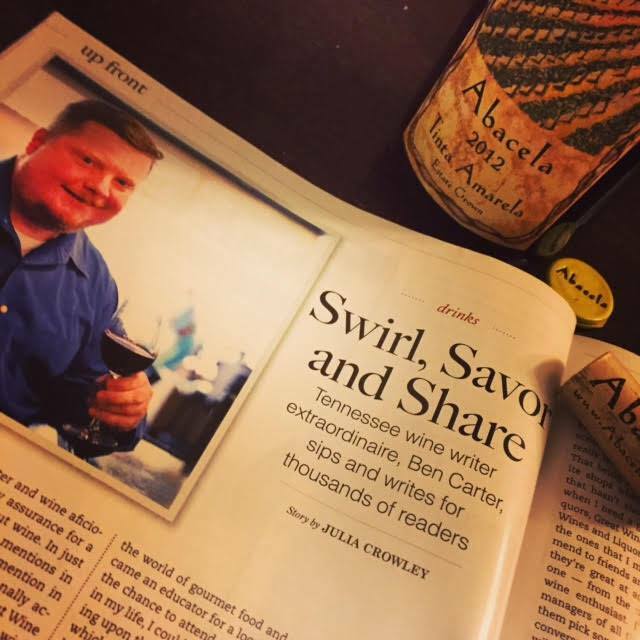 Titled, “Swirl, Savor and Share – Tennessee wine writer extraordinaire, Ben Carter, sips and writes for thousands of readers,” it was now my turn to be a good listener and get to know Ben. And just like Ben had accomplished with me, I learned more about the life of Ben Carter than what is portrayed in the article, and for that, I consider myself blessed. I can’t think about Ben without thinking about his beloved dog, Bella, who would frequently join him on his outings. 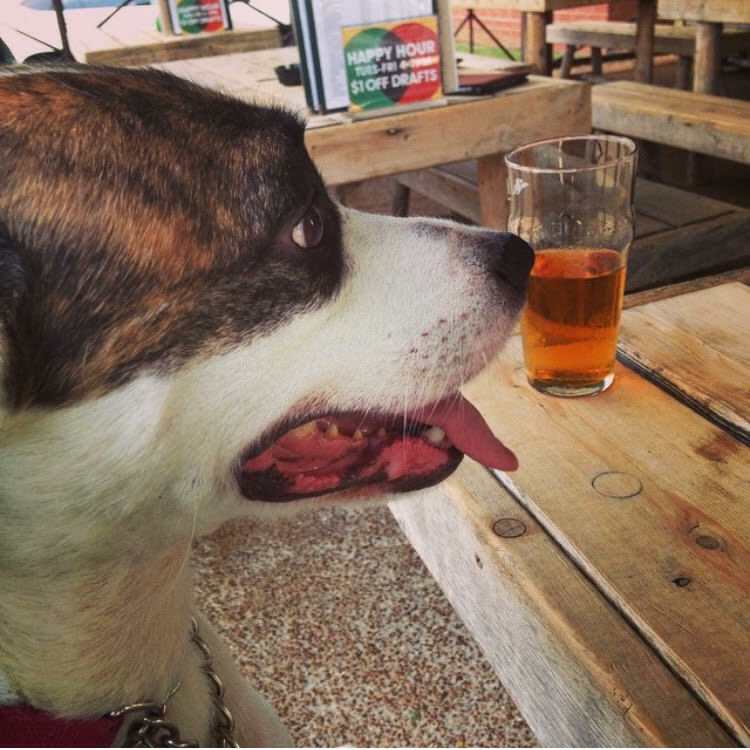 Bella is pictured here at the Flying Saucer in Memphis. Ben’s wittiness, clever remarks, infectious laugh, remarkable listening skills and way with words were topped by his kindness and generosity. In 2014, my website was hijacked and the shipping address was changed (without my permission), so the wine samples that were intended for me were being routed to someone else. Desperate to reclaim my identity and retrieve my website, I turned to my wine-writing friends I had met in New York City for advice and support. Ben and several others jumped into action by taking my emergency and making it theirs. Armed with unparalleled talent, creativity, kindness and generosity, my site was back up and running in a matter of days thanks to my friends. 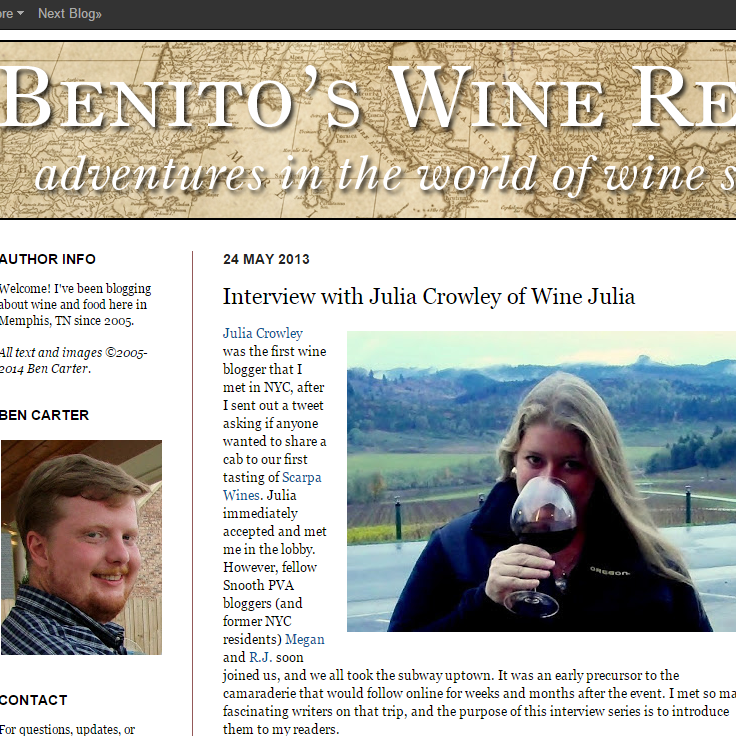 Tainted by the hijacker, WineJulia.com needed a new name and a fresh look. After just a few short conversations on the subject, Ben, savvy and quick-witted as usual, came up with The Real Wine Julia – Accept No Substitutes. Impeccably ideal (especially considering the wacky circumstances), I loved it and started using it instantaneously and without hesitation. But when he surprised me with a new logo and site design that he had quietly created, using several different special fonts that he felt portrayed my history, personality and taste, I was stunned by his thoughtful kindness. Even more so when emails from Ben continued to arrive in my inbox: one with monograms he had created for merchandising purposes and another with multiple Facebook cover designs so I could start the re-branding process as quickly as possible – he thought of everything, I mean absolutely everything! He had taken what he learned about me in his interview questions and created an entire branding of my style with perfection. His efforts made me feel like I was one incredibly special gal. Knowing that I had lived many years in the Middle East, Ben created a logo for me using several fonts; including, an Arabic-style font that he thought reflected my personality and background. I was concerned about how to repay him for everything he had done for me. But Ben was insistent that I simply carry on with my passion of writing about wine, claiming that my site would be his key to keeping up with Oregon’s wine scene. At one point, after I thanked Ben the millionth time for all he had done, he wrote, “Glad to be of assistance. A Southern Gentleman can not stand by while a woman is wronged.” He also didn’t want me to publicly thank him – he firmly believed that the camaraderie in our industry simply included having each others’ backs. On Christmas Eve, Ben passed away in his sleep from a heart condition. 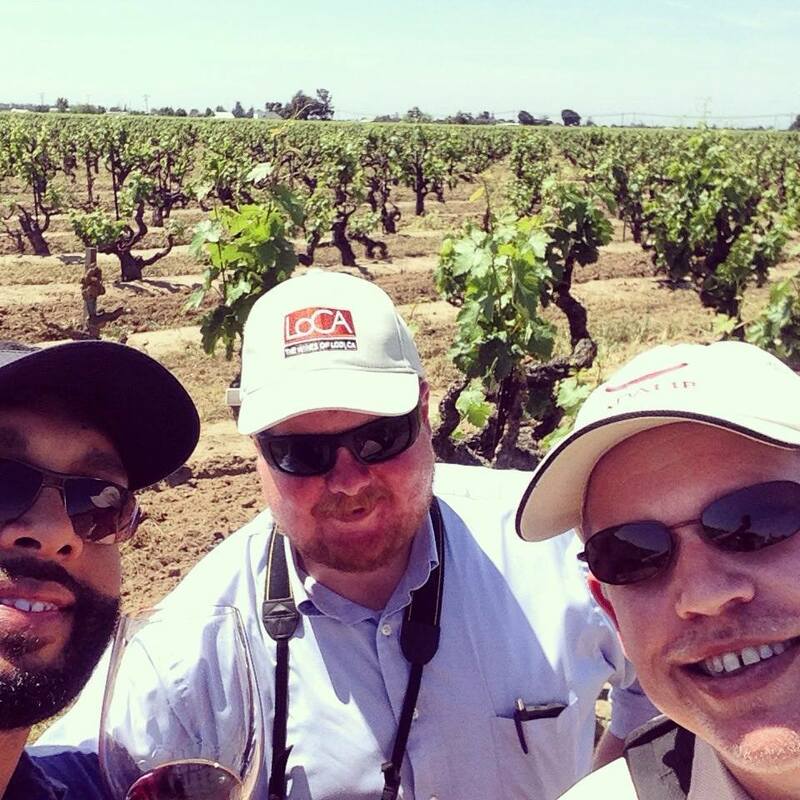 His sudden and unexpected death has shaken me – and the entire wine writing community – to the core. The heaviness I feel in my heart is indescribable. Ben’s Facebook page is overflowing with heart-felt comments and full-blown stories from people who knew him. Come to find out, I was far from being the only person who experienced his acts of extreme kindness – that’s simply who he was. Turns out, there was really nothing that special about me after all, it was Ben who was the truly special person. Farewell, Ben Carter. It was such an honor to have had the opportunity to call you my friend.